Description: For D10, D12, D14, D15 (except Series II serial number 9001 and up). With 138 or 149 CID 4-cylinder gas engines. This basic kit contains a sleeve and piston kit with rings, pins and retainers, an overhaul gasket kit. No bearings or pin bushings. New, aftermarket Allis Chalmers D12 Basic Engine Kit for sale with a solid manufacturer warranty. In addition, we have a generous 30-day return policy if this item needs to be returned for any reason. Please see our Parts Warranty and Return Policy links on your left for complete details before returning. An engine rebuild kit can add years of life to your old Allis Chalmers D12 tractor and help reduce wear and tear on other parts of your machine (such as the cooling and exhaust systems). The kits we sell offer the quality tractor parts you need in one package at a much lower price than if you were to buy the parts individually. If you don't have a service manual yet we have copies of the original factory shop manual for most tractors. If you can't find it in our online catalogs just give us a call! Delivery is via UPS Ground or USPS Priority and usually takes 3-5 business days. The shipping charge will be displayed in your online shopping cart. 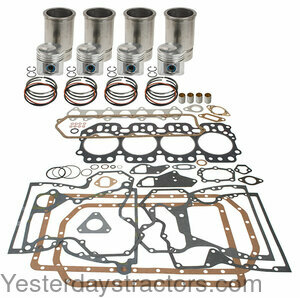 To purchase this basic engine kit, click the "Add to Cart" button or call toll-free 800-853-2651. ABOUT THIS PAGE: You are viewing the product page for our Allis Chalmers D12 basic engine kit. As one of the largest suppliers of new and rebuilt Allis Chalmers D12 tractor parts we most likely have the basic engine kit you need. Use the information above including the basic engine kit part number and picture (if available) to assist you in making your decision to purchase. If you are looking for a different basic engine kit, or have trouble locating the Allis Chalmers D12 parts you need, we have MANY parts that are not listed on our website so feel free to contact us.